A little behind schedule (again!) we arrived in Lambert’s Bay and were shown around the harbor, outside of which is a ‘moerse’ Cape Gannet colony known as Bird Island. We observed the rather territorial behavior of the adults amongst a tightly knit living area, as well as the first tentative flaps of juvenile birds, yet to take their first flight. Just beyond these sea-faring birds was a colony of Cape Fur seals that actually need to be controlled by Cape Nature as they will invade the breeding area of the Cape Gannets and could have a detrimental effect on the bird population. An uneasy truce exists between the rocky outcroppings and the main land, tightly policed by the conservationists that look after the island. 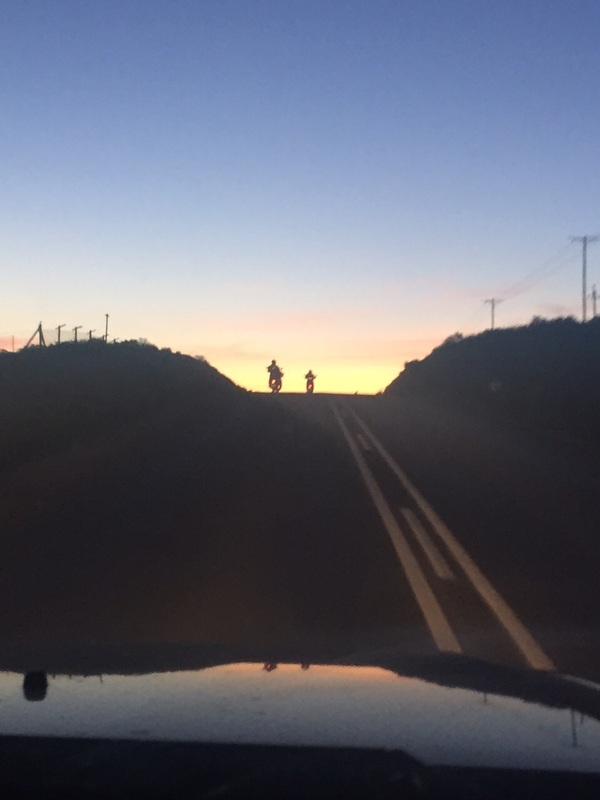 The flat & straight roads of the coast gently gave way to the more undulating & winding roads of the Cederberg foothills. A hop, skip & a scoot from Lambert’s to Clanwilliam (formerly Jan Dissels Vlei prior to 1814) for some rock art history. A very informative Clanwilliam Tourism guide named David, took us to the unmarked site of the paintings and explained how these had come to be there, some 1000 to 2000 years ago. Basically the shaman of the tribe would go into a trance with the help of the entire tribe (group dancing and chanting and so on…) and once out of this trance he would paint the visions he had seen. The occasions giving rise to these “trance dances” (very different to those frequented by today’s youth) would be simple necessities such as food, water and health – the Shamans would dance to control the movement of animals in the region, summon rain & even to heal the sick. The paintings themselves, although in a rather cramped out-of-the-way rocky outcropping, are really very clear compared to others I have seen and if bushman history is something that speaks to you then you definitely need to visit Clanwilliam – and probably before some of the sites are covered by water thanks to the new dam construction! From Clanwilliam on to Vredendal. This has undoubtedly been our longest day of actually riding on the scooters and we had covered some serious ground during the day. On the rather long stretch into Vredendal, with an aching back and rather tired eyelids, we made our way steadily back towards the coast (at the max speed of a 125cc Vespa which around 100Km/h) There truly is something magical about the fading light on the West Coast and as we made our way into Vredendal at dusk, despite desperately road-weary bodies, I couldn’t help but be consoled by the gentle warm coastal air and the golden light and I experienced and almost out-of-body calming as we wound our way to the end of the day. Arriving at Tharrakamma Guesthouse I wanted nothing but my bed. 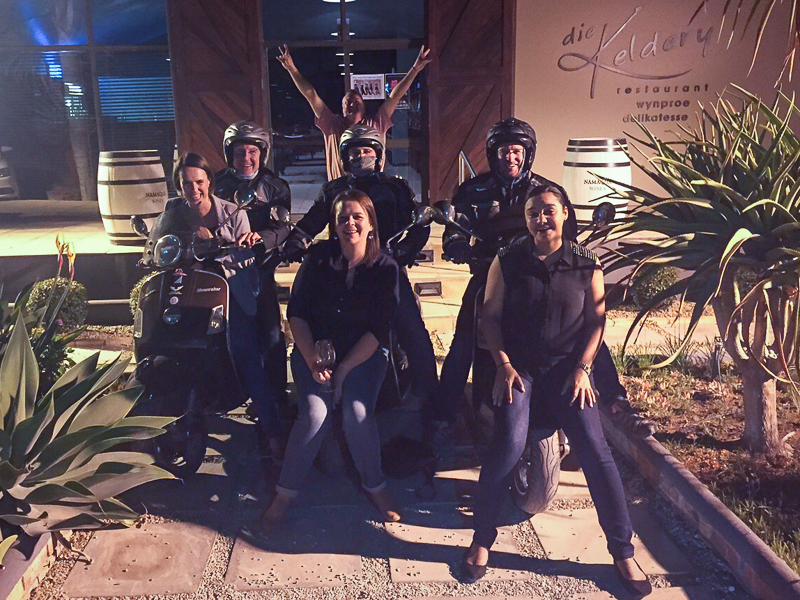 We’d been booked to have dinner at Namaqua winery at Die Keldery restaurant though and so with barely a glimpse of my bed, we were off to dinner. Monika met us at the door and introduced us to the local wine makers – Roelof & Len. The longing for my bed soon disappeared with the friendliness and genuine human warmth that our hosts greeted us with. Monika even commented that she had been following our exploits thus far and was very worried that they wouldn’t measure up to all the activities as they were simply serving us dinner. Can I just say that it was the best night of our tour so far! Kicked off by some local children performing Riel dancing for us – stemming from a kind of melting pot of cultures from Griqua to San to Voortrekker, the fleet-footed dancers pranced around the outdoor dance floor with very animal-like movements (the San influence shining through) to a typical West Coast, David Kramer-style music. Find of the week simply has to be the twin to ‘Jonathan’ of Radio Raps fame (if you haven’t heard of Jonathan before then do yourself a favour and search for “Jonathan se golflesse” on Youtube right now – absolutely hysterical) His real name of course is Len Knoetze and he is the production manager of Namaqua wines. His simple approach to wine as a means of enjoyment meant that while his passion for quality is clear, he doesn’t mind showing the lighter side of things, most often through mixed metaphors such as “It bears fruit like a rabbit!” when describing the Chenin Blanc varietal that dominates the region. If I am blatantly honest, the only Namaqua wines I could think of off the top of my head are the ones that come in boxes. I discovered though there is so much more to the wine farm than this & Len himself even refers to the “the dark side” of box wine that makes all his experimentation and genius in his “chateau” possible. We sampled a particularly fantastic limited release Pinotage that is well worth adding to your wine collection. He also noted that Namaqua wines, up until about 2007, processed more tonnage than the whole of New Zealand – over 100,000 tons. Now that’s a lot of wine!! A large amount of this is exported to all over the world so that everyone can enjoy the wine, in line with Len’s philosophy. Out and out my favourite night of the tour so far & hence this slightly longer blog post and my 1am bed time. True West Coast hospitality with some simple ingredients: Good food, great wine and ‘lekker kuier’ 🙂 I am sure that this isn’t the last time I’ll be sharing a meal with Len “C’mon boys” Koetze Traveller’s tip: (courtesy of Len) Wine needs to breath, boys. So sometimes you need to give it mouth to mouth. This entry was posted on May 8, 2015 by Rory Alexander Photography. 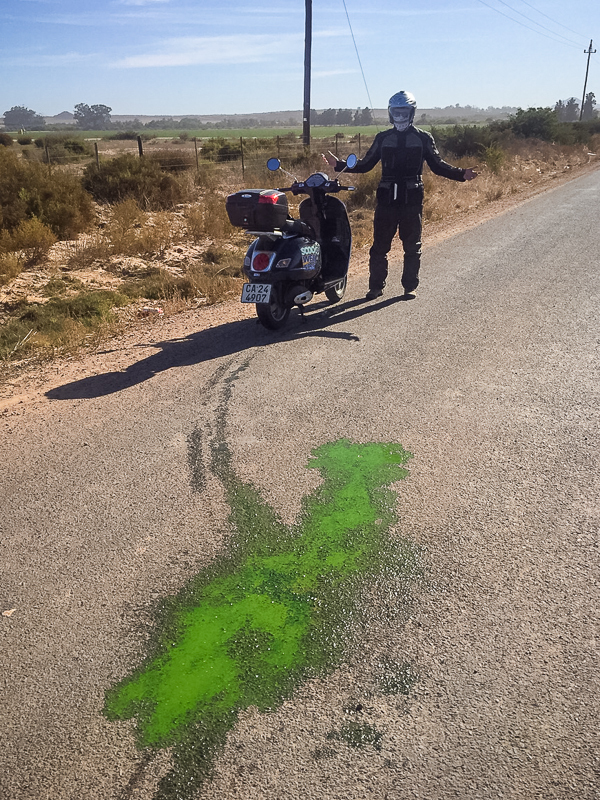 It was filed under Adventure, Travel and was tagged with adventure, Cape Gannet, Cape Town, friends, lamberts bay, outdoors, scooter, Scootwestcoast, South Africa, Vespa, Wesgro, West Coast. You guys are the best!! Thank you for a lekker kuier and we hope to see you again in our region. Thanks again for accompanying us to Doringbaai and I’m sure we’ll be visiting your region again before too long. Just loving this blog. What fabulous experiences you are having.